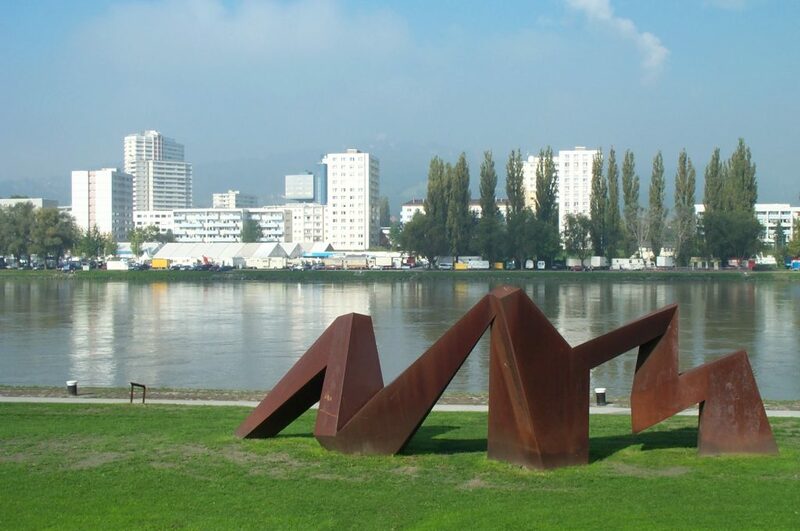 Linz is the first major city on the Austrian section of the famed Danube River. The Danube cuts through a steep and winding valley that opens up wide as the it reaches the city from the west. That the river plain surrounding Linz might flood on occasion would explain why most of the city’s greater attractions are further inland. Since I visited in the mid-spring, as the Alpine snows were quickly melting, I got to see the river moving very fast and high (and therefore very brown, the “Blue Danube” this was not). 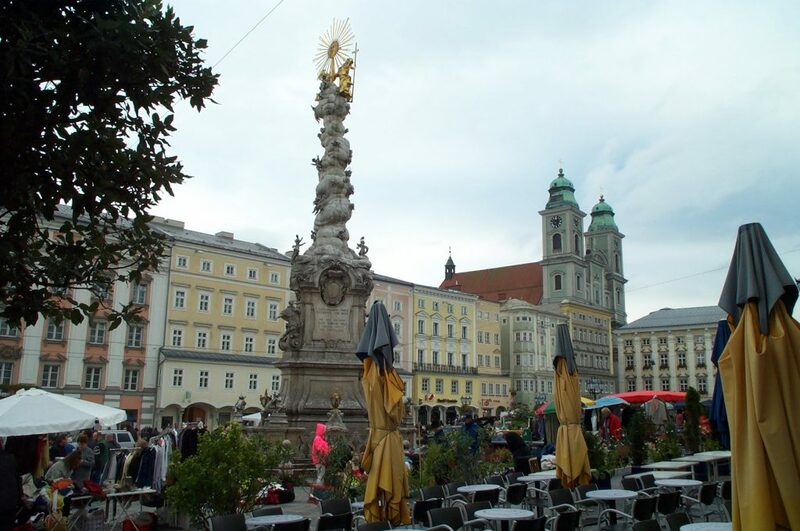 This chapter in the Linz travelogue covers the areas along both bank of the river, from the main market square just off the southern bank to the fairgrounds in the north. 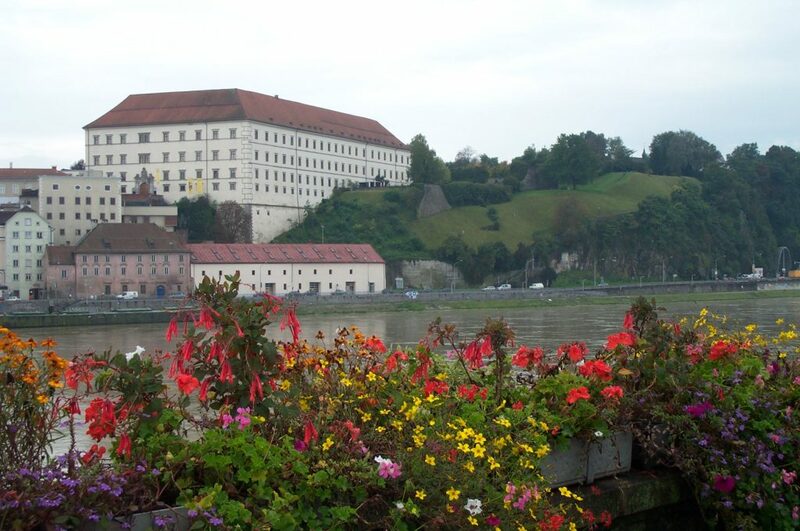 The first photo above shows the Linzer Schloss, the city’s palace, with its surrounding hills, lording over the Danube River. The open green area at the right side of the photo was part of the palace grounds open to the public with a terrific vantage point over the river. The grounds extended far up-river where I got a good look at the valley, but unfortunately it was terribly foggy so I couldn’t take a picture. I discovered in my journey that the Schloss replaced a much older, much more medieval-style fortress of which various remnants still remains. The best vantage points were from the still-standing towers. Sections of the wall have been converted to ivy-covered gardens. (I cover much more of the Linzer Schloss in the Linz City chapter). Heading south, the Niebelungen Bruecke goes directly to the city’s main marketplace, or Hauptplatz, which is shown in the second photo. The picture shown was taken in the very early morning with the Saturday market getting into full swing. Hundreds upon hundreds of people had congregated there to partake in the wide selection of antiques, collectibles, fresh fruits and vegetables, and clothing. The prominent features in the shot are the Altes Dom (old city Cathedral) in the distance and the Dreifaltigkeitsaule (the Holy Trinity Column). I also caught a glimpse of the Altes Rathaus at the far left (the white building with the redstone windowsills). One thing I noticed among Austrian cities is their affinity for cream yellow as the primary building color, giving streets and squares a sunny look. After venturing around the city and up to the Poestlingburg Castle, I returned to the north side of the Danube to visit the Linz Spring Festival at the fairgrounds. It was a good-sized event, as the third photograph above shows, and was very well attended — there must have been several thousand of all ages present. 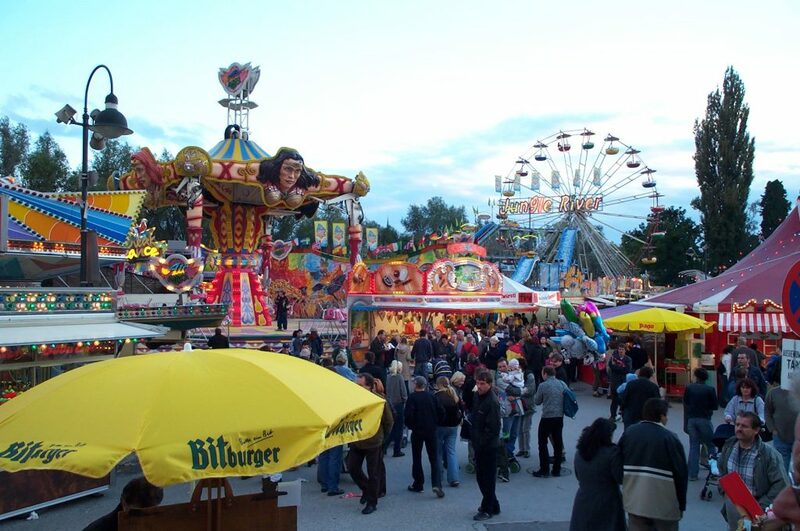 The event had all the usual trappings, such as plenty of rides, games, booths, bratwursts, and good-ol Austrian beer (which gives German beer a run for its money). I had a traditional cut of corned beef and sauerkraut in one of the food tents. Going on at the same time was a perhaps lesser celebrated market called the Urfahrenermarkt, located underneath the Niebelungen Bridge. This market offered mostly textiles and housewares. I was unsure whether or not this was a regular event. Of course, after stuffing myself silly on the Saturday night, I decided that I needed a good walk on Sunday morning to burn it off. The Enrst-Koref Promenade (above) that follows the Danube toward the industrial harbors to the east was the perfect place to do so. This promenade was an open-air modern art gallery, with its walking and running trails accompanied by a series of massive metal sculptures, some by artists from the former Eastern bloc. The fifth photograph shows one example of this artwork, albeit not the best as it has become rusted over time. These artworks were all rather large and abstract, breaking up the monotony of the open green grass of the promenade. 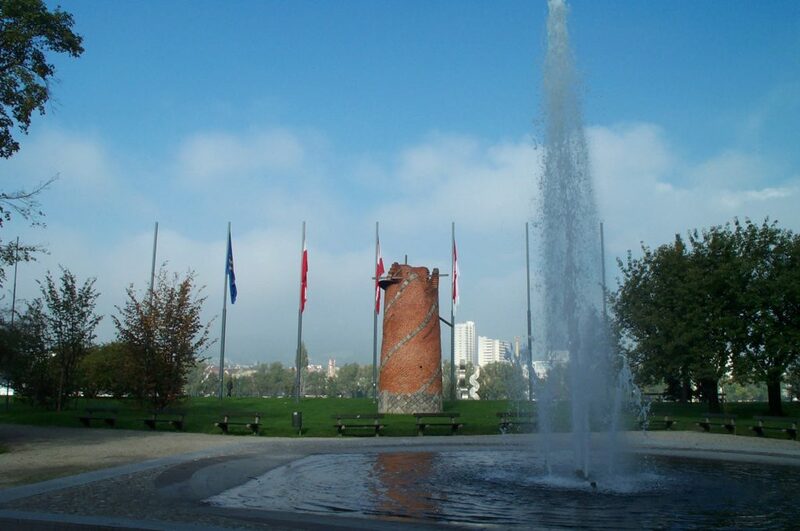 At the eastern end, just before the river bent south toward Linz’s industrial harbor was a tall, traditional graystone obelisk with an art-deco eagle mounted on top that commemorated the city’s World War II veterans. The fifth photograph also shows a glimpse of the Uhrfahrenmarkt as it prepared for a busy Sunday, and parts of an exercise track that lines the edge of the waterfront. Behind it was a number of office buildings and modern residences, a sharp contrast to the southern ‘old city’ or the industrialized eastern side.